Violet the beach donkey likes to be beside the seaside! She has a lovely soft grey coat and big kind brown eyes. Violet comes with a traditional donkey bridle, decorated with colourful tassels and bells. Expertly needle felted details to her face along with black beaded glass eyes bring the characterful donkey to life. Each Sew Heart Felt animal head is a truly artisan piece and is unique in its own right. Beautifully presented in an organic, cotton Sew Heart Felt drawstring sack. Measuring approximately 30cm x width 30cm x 25 depth. 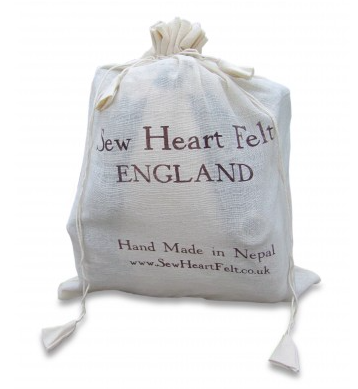 The Sew Heart Felt Collection is designed in England by Sonia Spencer and skilfully hand felted by women in Kathmandu, Nepal. The Sew Heart Felt collection provides sustainable, traditional work for women in rural Nepal. 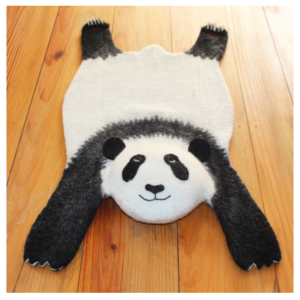 The felt is made from organic Tibetan lambs wool. The wool is first carded by hand and then dyed into different shades, and all the pigments are environmentally friendly. DO NOT USE WASHING MACHINE or TUMBLE DRIER WITH YOUR WOOL FELT. Wipe off spills immediately. Remove dried on dirt by scraping. A quick shake and air out will do the trick most often along with gentle vacuuming (Do NOT use the brush setting). Take your felt to a dry cleaner. Dry cleaning is safe for felt and is effective for most soiling issues. Air dry – do not dry in direct sunlight as natural dyes may fade. Remove grease and oils from felt with vinegar. If your felt has grease or oil on it, you can use white vinegar to dissolve the stain. • Use 1 part vinegar to 2 parts water. The vinegar smell will fade with time and will make the felt very soft after it dries. Do not soak felt in this solution for more than 15 minutes as that may damage the surface of the felt.